This artist's impression shows the Jupiter-like transiting planet HD 209458b around its sun-like star. The very high precision observations of carbon monoxide gas show that it is streaming with enormous speed from the extremely hot day side to the cooler night side of the planet. Across the Milky Way lies a violent world with the first"superstorm" ever spotted on an alien planet. 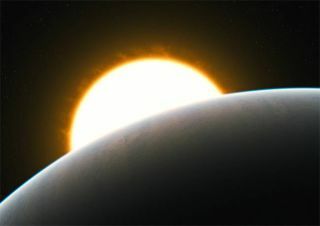 Poisonous carbon monoxide gas is streaming at enormousspeeds from the extremely hot day side to the cooler night side of the exoplanet,new observations show. This hot, gaseous Jupiter-like world is dubbedHD209458b, and lies about 150 light-years from Earth toward the constellationPegasus. "HD209458b is definitely not a place for thefaint-hearted," said lead researcher Ignas Snellen of Leiden Observatoryin the Netherlands. "By studying the poisonous carbon monoxide gas withgreat accuracy we found evidence for a super wind, blowing at a speed of 5,000to 10,000 km per hour [3,100 to 6,200 mph]." HD209458b has about 60 percent the mass of Jupiter, yetorbits its star only one-twentieth the distance between the sun and Earth,which are separated by about 93 million miles (150 million km). These closequarters give the planet surface temperatures around 1,830 degrees Fahrenheit (1,000degrees Celsius) on the hot side. The researchers think radiation from the star is driving thestrong winds and storms. The tiny orbit also keeps one side of the world permanentlyfacing its star ? and thus very hot ? while the dark side perpetually facesoutward and is frigid. "On Earth, big temperature differences inevitably leadto fierce winds, and as our new measurements reveal, the situation is nodifferent on HD209458b," said co-researcher Simon Albrecht of MIT. To learn about HD209458b, the astronomers observed it as itpassed in front of its host star ? a process that recurs every 3.5 days and isknown as a transit. When this happens, the planet blocks most of the star'slight, though a small fraction filters through theplanet's atmosphere, which leaves an imprint on the light. The researchers analyzed the faint fingerprints left bycarbon monoxide to determine how fast the gas was moving on the surface of theplanet. They could do this thanks to a phenomenon called the Doppler effect,which describes how light or sound waves will shift in frequency when theirsource moves. The changes in Doppler shift over time also allowed theastronomers to calculate the velocity of the exoplanet as it moves around itsstar, which in turn enabled them to deduce its mass. "In general, the mass of an exoplanet is determined bymeasuring the wobble of the star and assuming a mass for the star, according totheory," said co-researcher Ernst de Mooij. "Here, we have been ableto measure the motion of the planet as well, and thus determine both the massof the star and of the planet." Previous studies of this planet also detected the basic moleculesrequired for life in its atmosphere. The chemicals, including water, methaneand carbon dioxide, are promising signs in the hunt for life beyond Earth,though no evidence has yet been found for extraterrestrials on HD209458b oranywhere in the universe. The new observations provided more detail on the presence ofcarbon on the world. "It seems that H209458b is actually as carbon-rich asJupiter and Saturn," Snellen said. "This could indicate that it wasformed in the same way. In the future, astronomers may be able to use this typeof observation to study the atmospheres of Earth-like planets, to determinewhether life also exists elsewhere in the Universe." The findings are detailed in the June 24 issue of thejournal Nature.